Is military killing easier to rationalize when it’s done with a joystick? That’s the question at the heart of Good Kill, which looks at how drone warfare affects a group of military fighting the Taliban from crate-like structures in the Las Vegas desert. 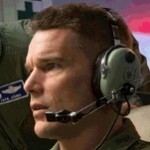 Written and directed by Andrew Niccol, the film, which screened at the Tribeca Film Festival, focuses on U.S. Air Force Major Tommy Egan (Ethan Hawke), who’s served six tours of duty and is itching to get back to ground combat. Now, though, he, along with a small group of colleagues, watch the moves of terrorist suspects in Afghanistan on their monitors. 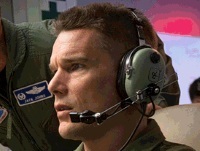 When all is in focus and when personnel receive the go-ahead from a commander, a quick hand movement of the lever to maneuver the drone effects the “splash” or direct hit on the target. Egan and his group, which also includes Vera Suarez (Zoë Kravitz), had been taking orders locally from Colonel Johns (Bruce Greenwood). But when the CIA steps in to dictate the kills, the rules of the game are drastically altered. The higher authorities are now much more willing to sustain the loss of innocent civilians and children who wander too close to the target. One of the more disturbing scenes in the film involves villagers who rush to the site of a kill to give aid and who, in turn, are also decimated, as collateral damage, in a new hit. Johns tells Egan, “We all pull the trigger in that box,” but the words neither comfort nor soothe. Egan, performing these remote kills early on, may have been able to compartmentalize his work more efficiently. No coincidence that the boxy entity in which the team works strongly symbolizes the ability to box off any moral misgivings. Not surprisingly, his increasingly erratic and angry behavior, along with an incapability to handle stress at home, heightens tensions with his wife (January Jones). The film is rich in archetypes. Martian images of soldiers, war, aggressive behavior and movement also imply blind obedience to a commanding officer. The ensuing rules and commitment generated from this partnership between soldier and leader are Saturnine, and punishment is exacted if discipline and follow-through are lacking. Not aligning these energies could mean the end of a military career. Archetype: Soldier. Ethicist. Duty. Blind Allegiance.